Did you know that there are THREE ways to define a trapezoid, or a trapezium as this polygon is classified in many countries? More importantly, do you know which definition you’re supposed to be teaching? 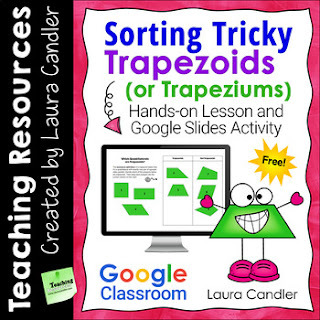 In Sorting Tricky Trapezoids (or Trapeziums), I explain all three definitions and provide two quadrilateral sorting activities for exploring the attributes of trapezoids or trapeziums. One is a printable hands-on activity for partners, and the other is a digital Google Slides activity. If you’re using Google Classroom, the most effective strategy is to start with the printable partner activity and assign the Google Slides activity later for independent practice or as a formative assessment. ❤️ Feedback Appreciated! ❤️ If you like this freebie, please click the Comments and Ratings tab and take a moment to leave feedback on it. Thanks so much! Check out these Google Classroom resources! More Geometry Resources You'll Love!